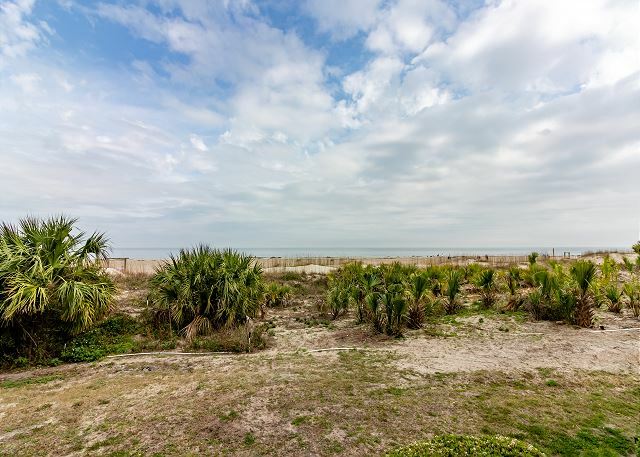 Tybee Island is famous for its protected dunes, but in this beautiful condo, you’ll feel as if you are sitting right on top of one, looking out to the sea. 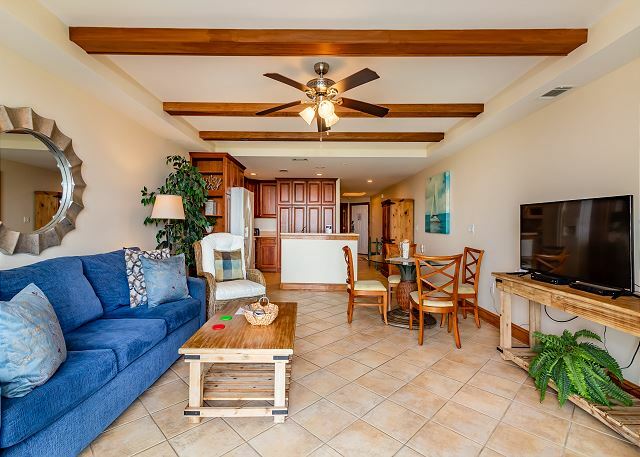 The open floor plan allows for a perfectly unobstructed view of the waves crashing onto the beach from the fully-stocked kitchen through the cozy living room, and out onto the private balcony. 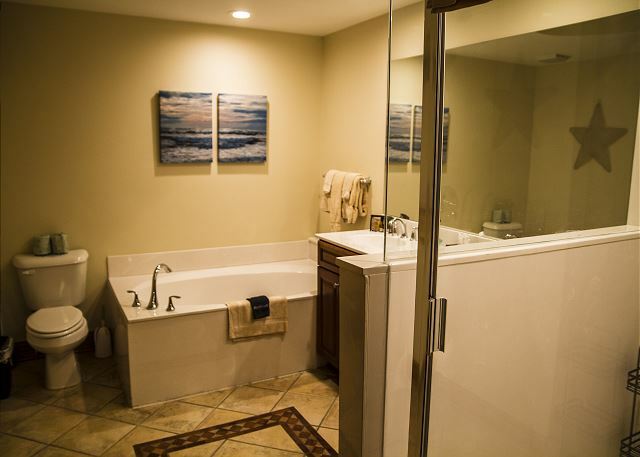 The master bedroom features a king-sized bed, and an ensuite bathroom complete with stand-in shower and massive Jacuzzi bathtub. ON THE BEACH, TAKES DOGS, THE BEACH DOES NOT TAKE DOGS!!!! They MISLEADINGLY ADVERTISE that they're on the beach and take dogs. Both true, BUT THE BEACH DOESN'T TAKE DOGS! Why would I want to bring my dog to a place on the beach if I can't take the dog on the beach? I could leave the dog in the room all day, but the dog would be understandably frustrated, and the WALLS ARE REALLY THIN, so the neighbors would understandably complain. In addition, they never got the bedroom TV to work over four days of asking. This was our 1st visit to Tybee Island. It definitely won't be our last. The staff at Beachside Colony made us feel right at home! I found this property on VRBO and decided to rent it for 5 nights. 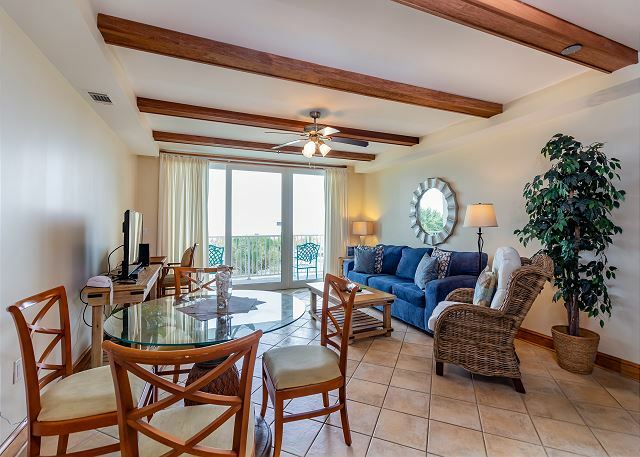 The location of the property was perfect, as this condo overlooked the beach and ocean. We spent a lot of time on the balcony enjoying the view and ocean breezes. 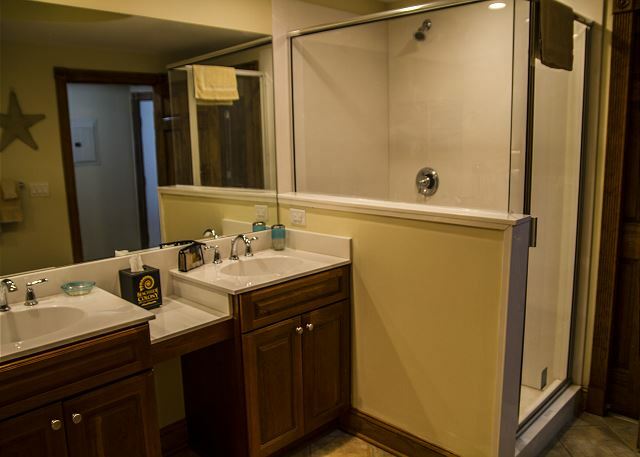 The property was very clean, neat, and well-maintained. The two times I dealt with the registration desk, they were very nice and professional. I would highly recommend this property to anyone looking for a one bedroom condo on the beach! Unit still undergoing some repairs from Hurricane. Those issues completely understandable. Not acceptable - went to beach. Came back and door was left WIDE OPEN. Maint person went to get an air filter... Next day, the property management walked in to show the condo to prospective buyers. Unpleasant surprise. Dirty dishes and shower corners yuck. Outside, trash was not picked up all week. New Management not to previous standards. Hope they improve. I stay at this facility every year and will stay again. Despite all, the condo is beautiful with the best views on Tybee. Love sitting on the balcony at night listening to the ocean. Still had a great time as usual despite a few problems. wonderful access to the beach, great rental. This is the second stay for us at Beachside Colony. The views from the Ocean Song building are great. The unit was clean and quiet. Don't expect any extras in the unit, though. Unlike owner managed units, the Beachside Colony units are stocked more like hotels. There were NO staples- no salt, pepper, sugar, or left over spices for cooking. The pots and pans were the bare minimum, so if you are going to do a lot of cooking, you may need to bring your own cookware. No coffee filters either, for the 4 cup coffee pot. So, the kitchen was a little disappointing. Water pressure in the shower was poor, but plenty of hot water for the big tub.Overall, a nice stay. The staff were friendly. The adjacent restaurant is good. Easy access to the beach. My husband and I greatly enjoyed our stay at Tybee at the Beachside Colony. The room was spacious, clean, and well-furnished. Our room was super close to the parking garage, which made brining in our stuff a simple task. We also had a very short walk to the pool and to the beach access from the resort. Because we were so close to the garage, there was some extra noise. We brought our dog with us since this resort is pet friendly! Next time we come to Tybee, we’ll definitely stay here again! We loved the ocean view! The location was great for all we wanted to do. It's close enough to Savannah to visit - and then return to the Island. The weather was cool, but expected this. There were not many sunbathers and we never saw kids in the pool. We enjoyed walking on the beach daily!The unit we rented was perfect for our plans. Overall, this room was very nice. Very spacious with a nice view of the ocean. However, the bedroom window is located within the parking garage area near the office and each morning we were awoken by loud noise outside the window including people talking, rolling luggage carts, etc. Due to the location of the room, all noise echoed due to being within the parking garage. If you are an early riser, this would be no problem for you, however we enjoy sleeping in while on vacation and we were unable to do so. Otherwise, the property was clean and we enjoyed our stay. 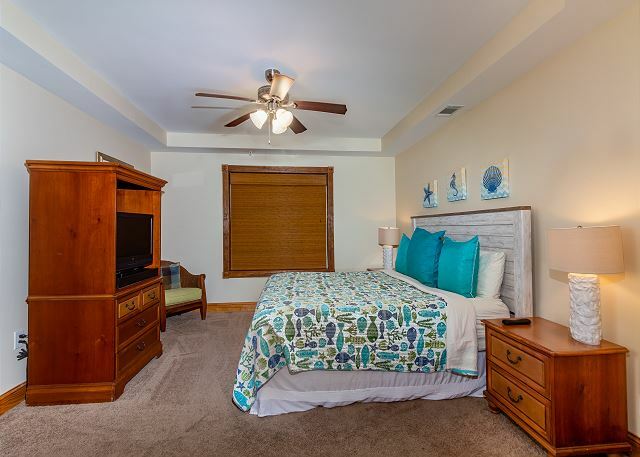 The unit was very nice and spacious.The unit could use an updated mattress in the master bedroom and the pull out couch bed was like sleeping on a spring. The balcony sliding door didn't slide well and locked us out while my family was outside. This was reported while we were there. Although the parking garage was a little noisy, the location and view were nice! We had a beautiful view of the ocean. The appt. was well maintained, clean, and had everything we needed. The jets in the tub did not work. The restuarant bar was not open every day during the week. We only had 2 days to stay and this was the perfect location. Easy beach and pool access. Not crazy about the bedroom being next to parking deck but there were really no problems with noise, etc. 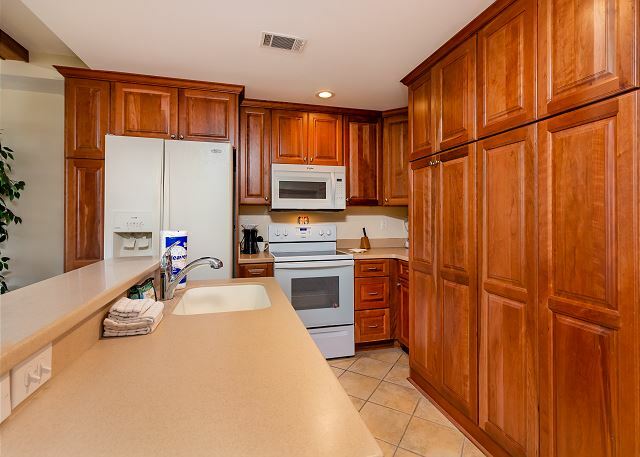 Unit was spacious and tastefully decorated but needs some minor repairs. Floors had not been cleaned very well, but there was no carpet to deal with. 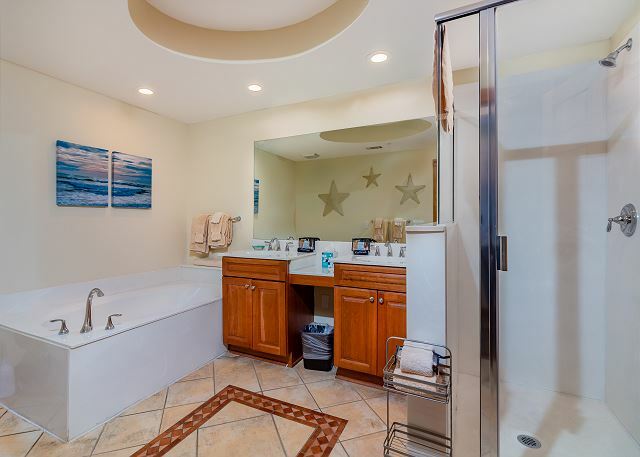 Loved the tile floors throughout! Arrived late and hungry. Marlin's Grill staff was getting ready to close up but were very gracious and served us dinner and drinks with a smile. Overall good stay. After staying 3 months in Fl, we decided to explore GA. What we found was a delightful, clean and accommodating condo. Everyone was helpful and we enjoyed our stay. Stayed for five nights here with my girlfriend and we were very happy with the condo. It was clean, neat and relatively quiet. The only drawbacks were the bedroom was right next to the parking garage so there was some noise, and if we were to come again we'd want a unit on a higher floor for a better view of the water. Access to the beach was great, and the pool area and Marlin Monroe's restaurant were right there. The property itself showed a little wear and tear, but nothing horrible. Front desk people were nice, and the location is convenient to everything. Overall, maybe not the absolute best place to stay in Tybee, but definitely not the worst. Our stay couldn't have been any better. Clean, well maintained, exactly as described online. In a word, perfect. Review by Brandon R. M.
We always enjoy our stay at Beachside Colony! The view in this unit was outstanding. The unit was clean and the bed very comfortable! 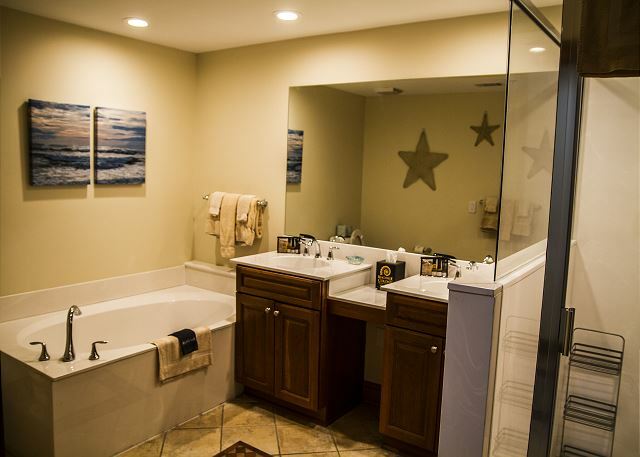 I really love the bathroom as well! The owners should upgrade the cookware because the pans were very hard to clean. Our main complaint were the CATS on the balconies and roaming the property! Tenants above our unit threw spaghetti over the balcony, which was disgusting, causing the cats to commune in front of our unit and the remaining spaghetti just lingered without the grounds keeper cleaning it up. This issue was brought to management and that's when we were informed they didn't manage all the units, so that explained the behavior upstairs. Overall, aside from the cats and above tenants, our stay inside the unit was good! The accommodations made it hard to leave. The condo was clean, inviting, and comfortable. It provided everything we needed! The resort was exactly as advertised as was the unit. Great location and view of the ocean. Pet friendly which was important to us as we brought our dog. Stray cats were a nuisance because they drove my dog crazy resulting in a lot of barking. Since property will attract travelers with dogs, cats should be removed so there would be less barking. If I was staying there and didn't have a dog, I wouldn't have been happy with all of the barking. Hard for me to complain since my dog did a lot of the barking, although it would have been diminished if cats weren't there.Garbage disposal was not working when we checked in. I fixed it myself as it had large items of food stuck in it. Cleaned it out and pushed reset button and then everything was fine. Should have been done prior to our arrival; was easy to notice as water was draining very slowly in the sink because of the blockage.Everything else was very good. Overall beautiful rental. Gorgeous beach view. Heated pool!! We were satisfied but I strongly suggest that Beachside needs to invest in double pain windows for the first floor of the Ocean Song units. We have stayed on the first floor three different times and the noise is horrific. The noise from the garage is annoying when you are trying to sleep. You can hear all the cars coming in and out, alarms going off and people. The Jacuzzi water in our unit never warmed enough to use the Jacuzzi and the Jacuzzi was cracked. I also noticed the door did not seal very well and needed to have the weather stripping replaced as well as the dead bolt did not work either. Other than that the unit was awesome and the staff was great. This will not stop us from coming. We are will just try to get a room other than the first floor. We had a wonderful view with easy access to the beach and pools. The rooms were spacious and well mantained. We will be returning soon and have rebooked this room. Great beach location. Our room looked out over the beach and access was great. The beach and the resort pools were very clean. The staff was always very helpful and accommodating. We also spent time touring Savannah and the drive back and forth was easy. I would definitely stay here again. It was clean and loved the balcony. The beach is right out the door! Will stay there again. This was our fifth stay with Beachside Colony -- every time has been just fantastic. 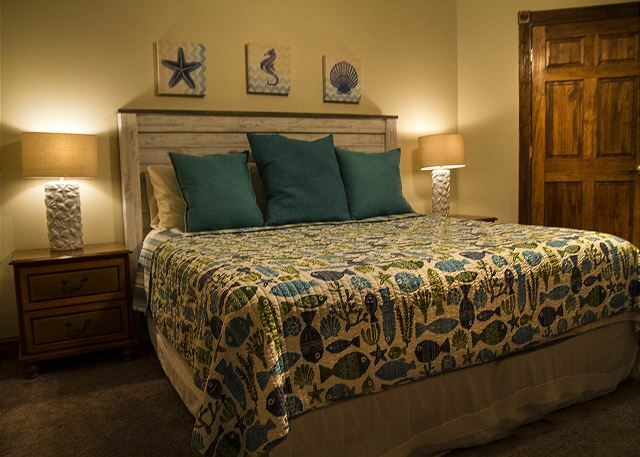 There's not a better place to stay anywhere on Tybee Island. Right on the beach -- restaurant and bar on site -- you don't need to go anywhere once you arrive ! The staff here are ALL great people - very helpful and friendly. 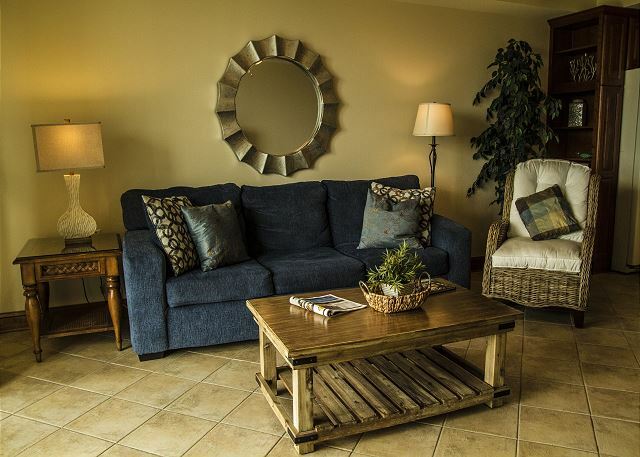 Beachside Colony should be your only choice when staying on Tybee Island ! Our stay was very pleasant. The pool chairs need upgrading. Condo conveniently located. Bedroom linens and comforter need upgrading. Door jam on floor between bedroom and foyer needs to be repaired. Otherwise the condo was extremely nice and well appointed and has a beautiful beach front view. 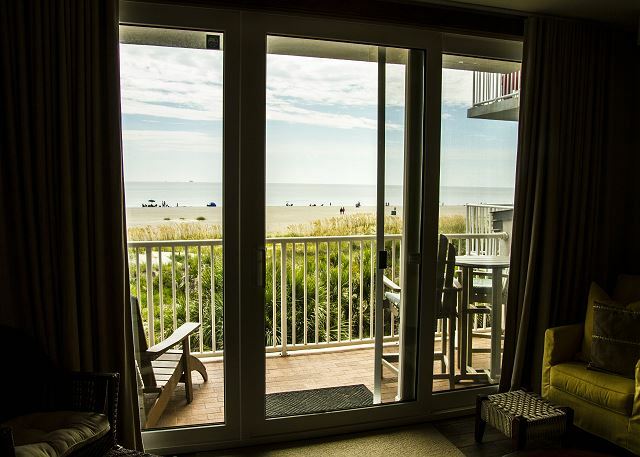 We would highly recommend Beachside Colony and would be happy to stay in #314 again. 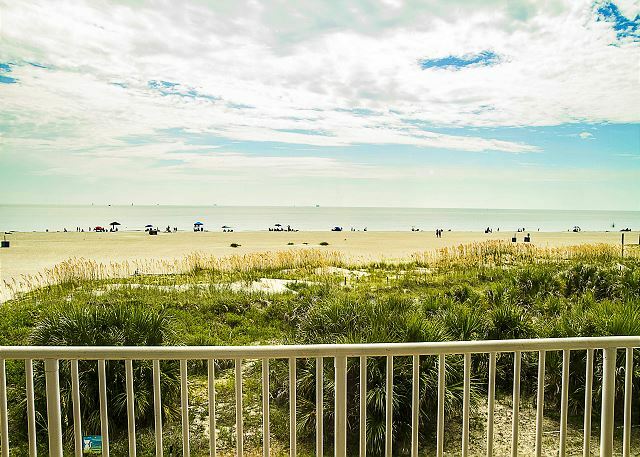 Beachside Colony at Tybee is our new #1 vacation spot! Spent three nights here for my wife's birthday, loved the room, location and staff. Will definitely be returning! Loved the ocean view & amenities of our room...Only concern, the MBR bordered the parking area (common area) where many people tended to gather late at night to have a drink, conversation, etc., all of which could be heard very clearly from our room. Overall we were very pleased w/the resort, pool (didn't try the restaurant), but loved the pool & beach. Our rental was great! Quiet and relaxing! Just what the doctor ordered! The floors of the condo were filthy. The location this particular condo is just outside the reservations office. You could hear people early in the morning when you were trying to sleep and at night as it was a commonly traveled area. Great location to pool and beach. Ocean song is a nice room. Will stay there again next year. I did find the floors need a good cleaning, but the rest of the room was spot on! We stayed in Ocean song 314 and in Garden 701. We had a great time in both locations! The room was great we couldn't have asked for amything better. Worth every penny...the best place to stay on Tybee!!!! We were very pleased and had a wonderful vacation. I really enjoyed the home atmosphere. Our experience was great!! The staff was friendly and helpful, the amenities were outstanding, and the location couldn't be any better. Beachside made bringing our puppy-dog along extremely easy and were accommodating as well. I would recommend Beachside (and already have) to anyone. We are looking very forward to our next visit there.